The Osteria Supper Club, set up by Mexican couple Marco Carboni and Carmen Kabel, is back on 4th September for one night at Frizzante Restaurant at Hackney City Farm. It's a very friendly supper club, with all guest sitting at one big table, and the theme this time is Venetian, including a grilled octopus salad. It's just £30 for 4 courses, plus an aperitivo. 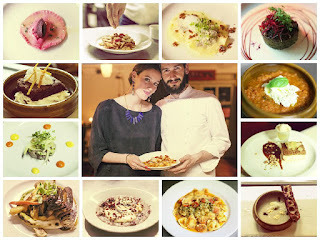 "This time we brought Venetian cuisine at its best, influenced by the travel of its merchants. Think Polpo meets Asia, think Marco Polo’s wife cooking for him after he is back from one of his trips. Silk, spices and oils, but most of all, precious tea. It was in fact in Venice that the first Western record of tea occurred. We will celebrate the cuisine of the Serenissima, drawing an imaginary trip to the far East. The meal will feature creations made with the artisan Taiwanese teas of Dachi&Co and tea seed oil by Cha Tzu Tang. Riso e latte, vanilla pod, lemon zest, Frozen Summit Oolong cold brew"